(United Kingdom) Sara and her family held Ependymoma Awareness Day in The Victoria Shopping Centre in Harrogate, North Yorkshire UK. 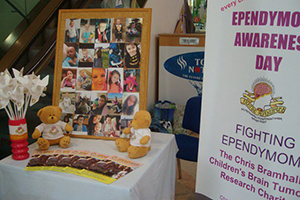 They were in the centre for eight hours talking to people about paediatric ependymoma and giving out leaflets and magazines. They have been holding an event on and off since 2012 in memory of Chris who sadly passed away in 2013 at age 21. In his memory, they have also created a registered charity, Fighting Ependymoma, to support paediatric ependymoma research. Brenda and her family held a memorial walk after her older daughter’s graduation party. 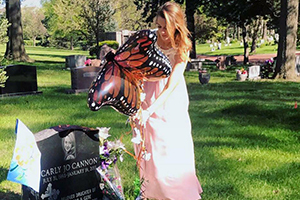 They honored her younger daughter, Carly, who passed two years earlier after a two-year battle with ependymoma. Her older daughter graduated nursing school and was inspired to become an oncology nurse after witnessing the cancer journey first hand. They also held a balloon release of monarch butterflies where love notes were attached. 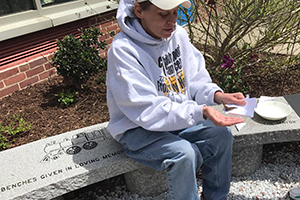 (Pell City, Alabama) For Lori, the past three years were filled with challenges, fear and uncertainties after she was diagnosed with an anaplastic ependymoma. Lori advocated for more funding for research and better treatments at National Brain Tumor Society's Head to the Hill. We are also honored she joined us at CERN Foundation’s butterfly release! (Gladwin, Michigan) Keenan was diagnosed in October 2013 with an ependymoma in the posterior fossa covering his brain stem. He went through chemo and photon radiation and was re-diagnosed with an ependymoma tumor in his L4 area of his spinal canal in June 2015. He underwent surgery, followed by photon radiation. 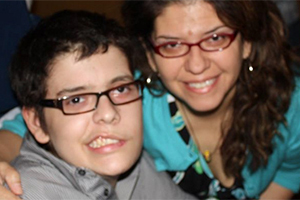 In January 2016, he underwent surgery to remove two ependymoma tumors in the frontal lobe of his brain. He then underwent proton radiation followed by oral chemotherapy. He just completed his Freshman year of high school while completing his chemotherapy. 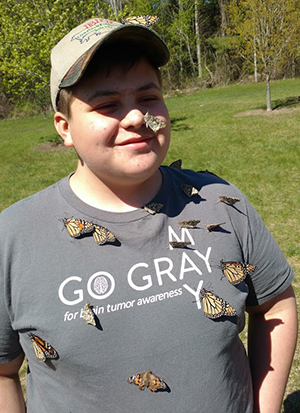 Because of his perseverance, his school, Gladwin High School in Michigan, celebrated with a penny war and butterfly release. Each class was tasked with collecting pennies to donate to the CERN Foundation in honor of Keenan's Kampaign against Cancer. The pennies were worth 1 point and any other currency meant points away. For instance, $1.00 in the Freshman bucket meant a negative 100 points. The Freshman class raised the most money but had the least points. The senior class ended up with the most points. In total, the school collected approximately $300! 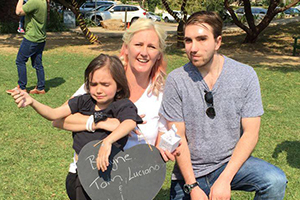 (Lonehill Johannesburg, South Africa) Ependy Angels held a picnic and butterfly release as a symbol of hope as community members and friends gathered to honour Ependymoma Awareness Day on May 6. This annual event was created in support of Layla, who has been suffering from an ependymoma for the past four years and to honour the other fallen angels as well as the children still living with ependymoma. Community members gathered for a day of family-fun with activities that included: arts and crafts, a play area, tea garden and multiple beautifully decorated cakes! 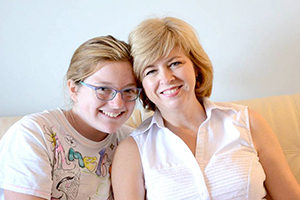 (San Diego, California) Jennifer, diagnosed with anaplastic ependymoma, and her daughters, Katie and Lily, hosted a butterfly brunch on May 20. They prepared brunch items like quiche, scones, fruit, crumpets and cupcakes for twenty of their closest family and friends. Some guests included two of Jennifer’s co-workers with whom she worked at the U.S. Attorney’s Office with and Katie and Lily’s cousins. They released 20 painted lady butterflies that all flew away except one lone straggler stayed on the porch for an extra day, slurping up sugar water and perched on the kids fingers. By the next day, he was gone and they are hoping he will fly back to see them at next year’s butterfly release! City and state governments have shown their support by issuing proclamations naming May 8, 2017 as Ependymoma Awareness Day; including: Kansas and Massachusetts. 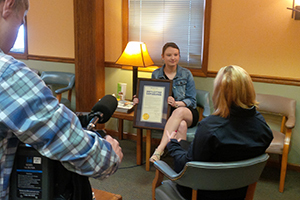 Many families, patients, bloggers and advocacy organizations spread the word about Ependymoma Awareness Day and their experiences with local news services, on Twitter, Facebook or their personal blogs. Search #CERNbutterfly for posts.